Brisbane was a pretty important place in World War II. US General Douglas MacArthur, who was Supreme Commander of Allied Forces in the Southwest Pacific Area, was headquartered here in Brisbane at the office of the AMP Society on the corner of Queen and Edward Streets - more on that in a future post. The building reverted to AMP after the war, but when the insurance giant moved to new premises in Creek St during the 1970s, the older building was renamed MacArthur Chambers (now MacArthur Central, a new shopping mall, has been built next to it) in honour of the famous general. MacArthur wasn't the only Yank in town at the time, although being from Arkansas, MacArthur probably would have resented being called a Yankee. 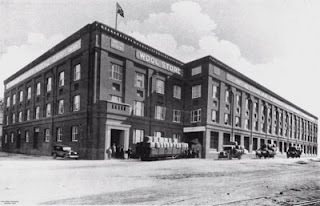 Ships of the US Navy were regularly here at the Teneriffe Wharves, and the Australian Estates & Mortgage Co Ltd (below) wool store building was used by US personnel. There were US Navy barracks in Dixon St and also in Sydney St, and the US Naval officers' barracks were on the corner of Ann St and Commercial Road. Apparently the tram rides between the City and New Farm were heavily favoured by Brisbane girls as an opportunity to meet US servicemen. I have been able to include some modern motor vehicles for comparison, but alas, no horse-drawn vehicles were available when I took this picture! I would suggest that parking in front of the building is far more problematic now than it may have been in 1928. Although the flagpole is still present, the current residents aren't flying the Southern Cross these days.